I assume you know by now that Beyoncé is pregnant with twins. (If you’re just now learning the news, allow me to welcome you to planet Earth.) She is also slated to perform at Coachella in April, and perform she will — probably. Sources say that at the Grammys last night, a member of her production team asked Bey about the spring music festival. She responded that those plans remain unchanged so long as her health is up to par. Delivering twins may bring an increased necessity of bed rest, so perhaps Beyoncé is thinking in those terms. Seems reasonable! That said, Beyoncé has promised to compensate her team regardless of whether or not she performs. A good queen always does right by her people, after all. 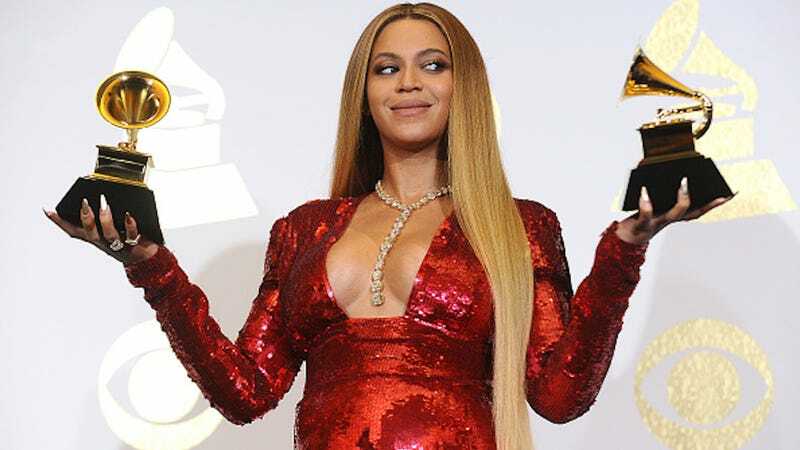 However, Bey has not disclosed how many months pregnant she is and, apparently, some of her production team hadn’t seen her baby bump until Sunday night — thus the backstage discussion. As for me, I’m just thrilled for the endurance of the Knowles gene. Goodness knows that family is a blessing upon our scorched earth. Robin, what in the everliving hell is this nonsense? Amidst a fierce custody battle with ex-wife Paula Patton, it seems 39-year-old Thicke and his girlfriend, 22-year-old model April Love Geary, staged a little bath-time photoshoot, compliments of their adventurous puppy. To be clear, the pup is very adorable, and I approve of its presence. But whether Thicke was hamming it up or “just trying to protect [his] junk,” he looks like a damn desperate fool.